At 14.30 today, we identified a specific problem with a service related to eduroam, which we fixed. This improved the performance and availability of the eduroam service. We have since been monitoring and now believe that eduroam is stable enough for you to try. Can you please contact us if you are still experiencing issues. This morning our technical staff have attempted a second fix on the affected eduroam service. This has not resulted in a significant improvement to the service. We are continuing to work with our service providers to find a solution and will persevere until the issue is resolved. This issue is of the utmost importance to us. The UoS Guest Wi-Fi service continues to be available although under extreme pressure. If you persist with it, you may get a connection. The situation with eduroam is still ongoing. Engineers at our service provider and our technical staff continued to work on a solution late into the evening yesterday. This morning we attempted a workaround which has resulted in a marginal improvement but we are still seeing failed authentications onto eduroam. So the situation remains much the same as yesterday. Please be assured that we will continue to work as hard as we can on getting this situation resolved. Connectivity to eduroam continues to be inconsistent. The prognosis is a bug in the network administration product but further analysis is being carried out to identify the specific issue. Work will continue throughout the evening and if a solution is identified we would anticipate applying any fix around 0730 tomorrow morning. UoS Guest Wi-Fi is being rolled out to all residences. We are sorry to say that the issues with eduroam are still ongoing. We are working with engineers from our service provider to resolve the issue. At this point it is not really possible to say when the service will be fully restored but we assure you we are doing our utmost to resolve the situation. In the meantime, we have managed to extend ‘UoS Guest Wi-Fi’ out to JFC and Centro House. Lab PCs are functioning normally, however, if you encounter a faulty PC please report it to the Information Centre and we will endeavour to get it fixed asap. We have set up this outage as a Major Incident in UniDesk. 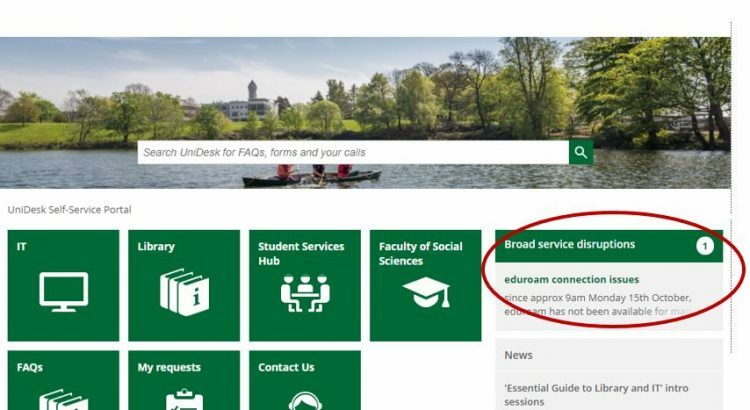 To add yourself to the Incident and receive updates and final notification when the issue is resolved, please go to UniDesk and click on the item under ‘Broad Service Disruptions’ and then click the button ‘I am affected by this disruption’ (see image above). You can then refresh the call periodically to see updates and we will email you when we have a resolution. The issue with eduroam which emerged yesterday is still ongoing and we are awaiting advice from our service provider. The problem is intermittent – many people are successfully connecting to eduroam while others are not able to get a connection. For those in the latter group, we advise that you can use student PCs in the Library, Study Zone, or the central computing labs. The ‘UoS Guest Wi-Fi’ service is also available across campus though this may reach capacity fairly quickly. We apologise for this service outage. We are doing everything we can to resolve the issue as a matter of urgency.